Triglycerides Diet vs. Cholesterol Diet - What Is The Difference? Another difference between a triglycerides diet and a cholesterol diet is the foods included. A cholesterol diet may have more fiber, because this substance helps to remove cholesterol from the body. 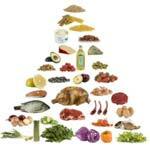 These diets are also intended to include foods which boost the good cholesterol, or HDL type. A low triglyceride diet mainly eliminates sugars as much as possible, and chooses complex carbohydrates over the simple variety. Another difference with a triglycerides diet is the alcohol factor. With a diet intended to lower cholesterol a glass of red wine is allowed every other day or two, because of the reservatrol and its benefits. The link between high triglycerides and alcohol consumption means that even a single glass of wine or other alcoholic drink may raise triglyceride levels, so red wine is prohibited for high triglycerides but allowed for high cholesterol diets in many cases. A triglycerides diet considers simple sugars more harmful than animal fats, while a cholesterol diet views animal fats as more harmful. A low fat and sugar diet can lower both of these fat types in the blood. Some triglycerides foods to avoid include starches, such as potatoes, white pastas, and bananas. Simple sugars can be minimized by avoiding soda, candy, cakes, ice cream, cookies, and other sweets. Choose whole grain breads, brown rice, and whole grain pastas over the white variety.